From as young as six, youth members can participate in an award scheme suitable for their age group. The emphasis is on the youth member’s own interests, and award schemes cover dozens of topics and hundreds of badges to cater for young minds, eager to learn and explore. Each Section Award Scheme culminates in a top award, which has been designed to challenge youth members, but still be achievable for those willing to put in additional effort. Details for each Award are outlined in Section Record Books. To earn the Joey Scout Promise Challenge, Joey Scouts must complete a number of tasks demonstrating their understanding of the Promise. Cub Scouts who have earned their Gold Boomerang Badge, and a number of other badges can then complete further tasks including planning and leading a hike or day walk for a Group of Cub Scouts to receive the Grey Wolf Award. The Australian Scout Medallion can be earned by Scouts who have achieved their Adventurer Cord, and have demonstrated their Leadership abilities. Venturer Scouts achieve the Queen’s Scout Award through completing requirements in Outdoor Activities, Community Involvement, Leadership Development and Personal Growth. Rover Scouts earn the Baden-Powell Scout Award through setting themselves a challenging task taking into consideration the Aims of Scouting. On World Scout Day, 1 August each year, Scouts Australia reflects on the remarkable contribution each member and supporter of Scouting makes every day. On this day, Scouts recognises those Leaders and Supporters who have earned particular mention for their achievements. Awarded to both Adult Members and Supporters for the successful support, development or management of a Section or Formation, or for an intense contribution over a period of at least 12 months to the success of a major event or major activity. ‘Special Service’ is defined as making a noteworthy contribution in their role. This Award can be made in the first three year assignment / period of service. 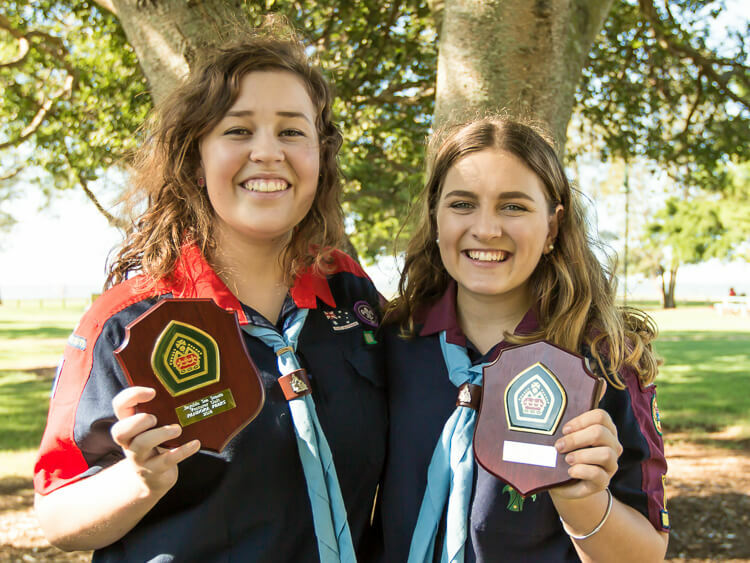 Awarded to both Adult Members and Supporters for meritorious or praiseworthy service to Scouts Australia for a period of around six to eight years. ‘Meritorious Service’ is defined as performing to a higher standard for longer or more intensely, than would be reasonably expected. Awarded for outstanding service to Scouts Australia as an Adult Member in an active Leadership role, for a period of around ten to twelve years. ‘Outstanding service’ is defined as a performance at a consistently high standard, normally over a number of assignments, all of which have provided positive outcomes for Scouting. This person’s contribution to Scouting clearly stands out from that of his / her peer group. Awarded for outstanding service to Scouts Australia for a period of at least twelve years, to non-uniformed Members and Supporters. Awarded for distinguished service to Scouts Australia as an Adult Member in an active Leadership role, for a period of around 14 to 16 years. It is expected that such distinguished service is at a consistently high level, normally over a number of assignments, resulting in a significant contribution to the wellbeing of Scouting and that the recipient is respected and highly regarded throughout the District / Region / Branch or Nationally. Awarded for further distinguished service to Scouts Australia by an Adult Member in an active Leadership role, for a period of at least four or five years since the Award of the Silver Koala. It is expected that such further distinguished service is at a consistently high level, over a number of assignments and at a number of levels within a Branch or at a National level, resulting in further significant contributions to the wellbeing of Scouting. Awarded for distinguished service to Scouts Australia as an Adult Member or Supporter for a period of around 18 to 20 years. It is expected that such distinguished service is at a consistently high level, providing significant and valuable support to a Group or higher Formation and that the recipient is respected and highly regarded throughout the District / Region / Branch or Nationally. Awarded for eminent achievement and exceptional service to Scouts Australia by an Adult Member in an active Leadership role, over a long period, in a number of roles at various levels within the organisation, or for a unique and highly valued contribution to the wellbeing of Scouting.